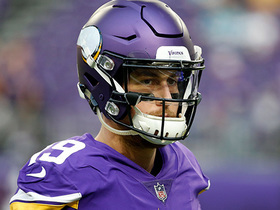 Brate is on the mend following arthroscopic surgery on a torn labrum in his hip last week, Jenna Laine of ESPN.com reports. Brate brought in two of four targets for 39 yards in the Buccaneers' 34-32 loss to the Falcons on Sunday. Brate brought in two of his three targets for eight yards in the Buccaneers' 27-20 loss to the Cowboys on Sunday. Brate secured one of two targets for nine yards in the Buccaneers' 20-12 loss to the Ravens on Sunday. 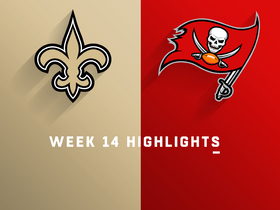 Brate brought in two of four targets for 12 yards and two touchdowns in the Buccaneers' 28-14 loss to the Saints on Sunday. Brate brought in three of six targets for 36 yards in the Buccaneers' 24-17 win over the Panthers on Sunday. 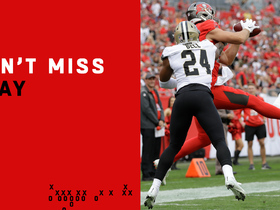 Analysis: As expected, Brate played a relatively modest complementary role in the Buccaneers' passing attack, and he actually drew even with the starting receiver duo of Mike Evans and Chris Godwin in targets. Brate should be in for a slight boost in his overall numbers over the season's remaining games while filling the role of primary pass-catching tight end, although his overall upside remains limited when all top four Tampa wideout options are healthy. 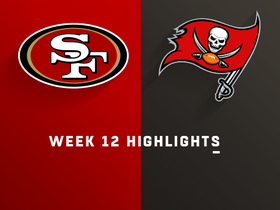 Brate brought in three of four targets for 26 yards and a touchdown in the Buccaneers' 27-9 win over the 49ers on Sunday. 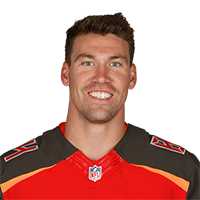 Brate is expected to step in as the Buccaneers' No. 1 tight end in Sunday's game against the 49ers after O.J. Howard (ankle/foot) was placed on injured reserve Tuesday, Rick Stroud of the Tampa Bay Times reports. Brate brought in two of three targets for 16 yards in the Buccaneers' 38-35 loss to the Giants on Sunday. Brate brought in one of three targets for 14 yards in the Buccaneers' 16-3 loss to the Redskins on Sunday. 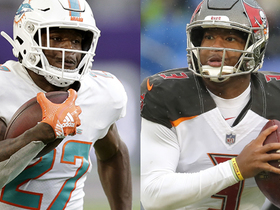 Analysis: Brate continues to play a clear secondary role in the Buccaneers' air attack, as he's now seen three targets or less in three consecutive games, and no more than four in any contest. 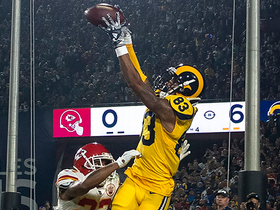 The 27-year-old has also topped out at 34 receiving yards, rendering him a fantasy afterthought as long as O.J. Howard remains healthy. Brate brought in all three of his targets for 15 yards in the Buccaneers' 42-28 loss to the Panthers on Sunday. 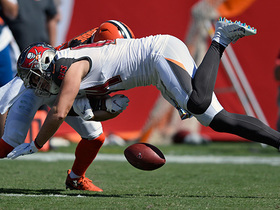 Analysis: Modest as it was, Brate's reception total matched a season high. The 27-year-old tight end continues to primarily be deployed as an in-line blocker while position mate O.J. Howard handles the bulk of downfield work. That naturally continues to limit Brate's fantasy upside, making him a consideration in only the deepest of formats at the moment. Brate will hope to up his production in Week 10 against the Redskins. 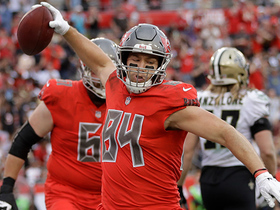 Tampa Bay Buccaneers tight end Cameron Brate makes an incredible touchdown catch vs. the New Orleans Saints in Week 14. Tampa Bay Buccaneers tight end Cameron Brate catches for a 1-yard touchdown, his second in the first half against the New Orleans Saints. 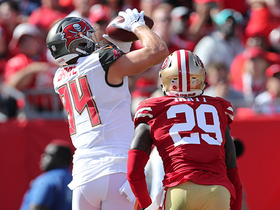 Tampa Bay Buccaneers tight end Cameron Brate catches for a 6-yard touchdown against the San Francisco 49ers. 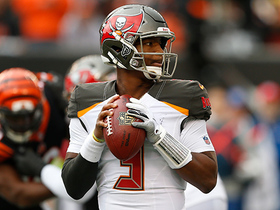 Tampa Bay Buccaneers quarterback Jameis Winston throws his third interception of the day on a pass over the middle. Cleveland Browns cornerback T. J. Carrie forces fumble to halt drive, Christian Kirksey recovers.